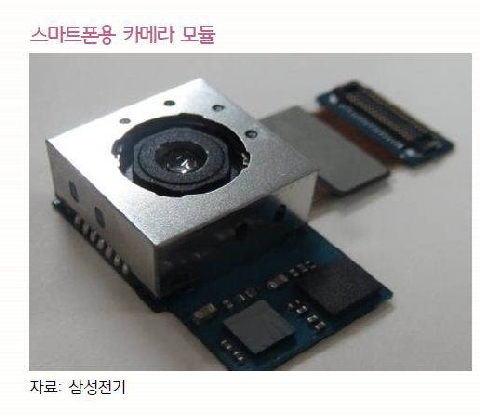 Samsung Electronics began to develop the 20-mega pixel smartphone camera module with a view to releasing it in the second half of 2014. Samsung Electronics wants to infinitely increase the number of pixels even after it applied the 16-mega pixel camera module to the Galaxy S5. As Samsung Electronics, No. 1 in the global smartphone market, decided to mount the 20-megapixel camera module in the next-generation smartphone, development of related parts, such as Complementary Metal Oxide Semiconductor (CMOS) image sensors, auto-focus (AF) actuators and high-index lenses, will gain momentum. According to the industry on December 1, the Advanced Development Team of the Wireless Business Division of Samsung Electronics began to develop the 20-megapixel camera module targeted for release in the second half of next year. Some forecast that Samsung Electronics would not competitively increase the number of pixels of smartphone cameras anymore after the 16-mega pixel camera module, or settle for a 18-mega pixel product. As the performance of smartphone cameras has already come close to that of compact digital cameras, they believed that Samsung Electronics would shift focus from pixel competition to functions like the optical image stabilizer (OIS). However, while Samsung Electronics was dithering due to unstable supply and demand, competitors like LG Electronics adopted the OIS function ahead of Samsung Electronics and they are using it as a marketing point. For Samsung Electronics to apply the OIS function to its flagship models like the Galaxy S series, the company must procure at least 50 million parts. But the number of OIS AF actuator suppliers is absolutely insufficient in Korea, and the production yield is rather poor. Samsung Electronics originally considered introducing the OIS function to the Galaxy Note 3, but postponed it until after the second half of next year. Instead, Samsung Electronics decided to continue its pixel race. Samsung Electronics resolved the procurement issue by recently entering into an agreement with SONY for the exclusive supply of high-pixel CMOS image sensors. As the System LSI Business Division localized the 13-mega and 16-mega pixel products, Samsung Electronics can now afford to participate in the pixel race. System LSI Business Division capitalized on the ISOCELL technology for converting the CMOS image sensor pixel structure from a plane to a 3D structure to successfully produce the 8-mega pixel CIS, and is known to have introduced the 13-mega and 16-mega pixel product samples. Samsung Electronics is known to adopt the 16-mega pixel camera module for 25% of the smartphones it will release next year. The 16-mega pixel camera module will be installed in one out of four Samsung smartphones. Considering that Samsung Electronics plans to ship 360 million smartphones next year, the demands for the 16-mega pixel camera module will reach 90 million. Its strategy is to use the 16-mega pixel smartphone camera to get the upper hand in the pixel competition next year, and consolidate its lead by commercializing the 20-mega pixel camera module in 2015. 삼성전자가 내년 하반기를 타깃으로 2000만화소 스마트폰 카메라모듈 개발에 착수했다. 갤럭시S5에 1600만화소 카메라모듈을 적용한 이후에도 무한 화소 경쟁을 펼쳐 보겠다는 의지다. 세계 스마트폰 시장 1위인 삼성전자가 차세대 스마트폰에 2000만화소 카메라모듈을 탑재하기로 하면서 상보형금속산화반도체(CMOS) 이미지센서?자동초점(AF) 액추에이터?압축 렌즈 등 관련 부품 개발에도 속도가 붙을 것으로 보인다. 1일 업계에 따르면 삼성전자 무선사업부 선행개발팀은 내년 하반기를 목표로 2000만화소 카메라모듈 개발에 돌입했다. 일각에서는 1600만화소 이후 삼성전자가 더 이상 스마트폰 카메라 화소경쟁을 벌이지 않거나, 1800만화소 제품 정도만 개발할 것이란 전망을 내놓기도 했다. 스마트폰 카메라 성능이 이미 콤팩트 디지털카메라에 가까워진 만큼 화소경쟁보다는 손떨림보정(OIS) 등 기능 중심으로 무게 축을 옮길 것이란 분석이었다. 그러나 수급 불안 문제로 삼성전자가 주저하는 사이 LG전자 등 경쟁사가 먼저 OIS 기능을 채택해 마케팅 포인트로 활용하고 있다. 삼성전자가 갤럭시S 시리즈 같은 플래그십 모델에 OIS 기능을 채택하려면 최소 5000만개 이상의 부품을 조달해야 한다. 하지만 국내에서는 OIS AF 액추에이터를 공급할 협력사 수가 절대적으로 부족한데다 생산 수율마저 저조한 상황이다. 삼성전자는 당초 갤럭시노트3에 OIS 도입을 검토하다가 내년 하반기 이후로 연기했다. 대신 화소경쟁을 이어가는 방향으로 가닥을 정했다. 삼성전자는 최근 소니와 고화소 CMOS 이미지센서 독점 공급 계약을 맺으면서 조달 문제를 풀었다. 시스템LSI사업부도 1300만?1600만화소 제품을 국산화하면서 화소경쟁을 벌일 수 있는 여건이 마련됐다. 시스템LSI사업부는 CMOS 이미지센서 픽셀 구조를 평면에서 3차원 구조로 전환한 아이소셀 기술로 800만화소 CIS 양산에 성공했고, 샘플용 1300만?1600만화소 제품을 내놓은 것으로 알려졌다. 삼성전자는 내년 출시할 스마트폰 중 25%에 1600만화소 카메라 모듈을 채택할 것으로 알려졌다. 삼성 브랜드로 나오는 스마트폰 4대 중 하나는 1600만화소 카메라모듈이 장착된다. 내년 삼성전자 스마트폰 출하 목표가 3억6000만대인 것을 감안하면 1600만화소 카메라모듈 수요는 9000만대에 이른다. 1600만화소 스마트폰 카메라로 내년 화소경쟁에서 우위를 점한 후 2015년 2000만화소를 상용화해 자리를 굳히겠다는 전략이다. 업계 전문가는 “과거 삼성전자가 800만화소 이후 1300만화소 카메라모듈을 차세대 스마트폰 로드맵에 포함시키면서 사실상 업계 표준이 됐다”며 “1600만화소 이후에는 2000만화소 제품이 대세로 자리 잡을 것”이라고 내다봤다.